Home > Articles > Thread Keeps Coming out of Sewing Machine? Check out the Common Mistakes and Their Solutions? Have you been into sewing and sewing machines only recently? Of course, if you have been one of those who is taking his or her first lessons in sewing and other elementary knowledge, it should be quite necessary to consider a few common sewing machine mistakes and attempt addressing them for better performance. 1 How to Avoid the Most Common Sewing Machine Mistakes? How to Avoid the Most Common Sewing Machine Mistakes? When you have purchased one of the best sewing machines in the country and begin working with it, you are bound to make a few mistakes. It could be possible you tend to forget a few important things and end up facing issues you don’t really understand. Well, there are several issues you may come across, but we thought of listing out a few major ones here. This is one of the most common sewing machine mistakes you may come across. You thread in the needle and just when you begin to sew by pressing your foot down – you end up finding the thread slipping out of the needle! Solving this issue may not be much difficult. Ensure that you have a few inches of thread pulled out to the other side of the machine before you begin working with it. This can help you get enough clearance left even if the thread pulls out the needle. Another option you can employ would be to check that the needle is at the highest position when you begin stitching. The needle will pull thread when it is moving up. Opting for these two methods should ideally help you address the concern if sewing machine needle doesn’t stay threaded. You may end up with the loopy stitch on one side while it may be tighter on the other. Most of us tend to think it as an issue with the thread tension setting on your machine. Of course, that may be true in many cases, and an adjustment of the tension dial can sort out the issue to a good extent. However, it may not always be the issue with the thread tension dial on your machine. The manner in which you have threaded the bobbin can also affect the performance of your stitch and make it uneven. Take out the bobbin and check if it has been wound and inserted in the right direction. Checking your sewing machine manual machine should be a good idea. This can be one of the serious issues with your sewing machines. Of course, some cases may be a result of the issues with your take up lever, but it can also happen because of the other mistakes that you be committing. You should attempt matching the thread and your fabric for the optimum results. It is also advisable to check if your thread goes properly on all the guides. Also, if the top tension is a little loose, it could be possible that you will end up with a botched up performance and the thread can keep coming out of the take up lever. This is one of the most common issues the newbies on the sewing machines can come across with. The threads tend to knot up on your fabric or get jammed inside your machine. You may even need to remove the needle plate to yank off the twisted thread. Before you begin sewing, make sure that both spool and the bobbin are sticking out towards the back of the machine. Avoid sewing right at the edge of the fabric, but ensure that you are stitching a few millimeters inside. If the fabric is too thin or there is no much of the fabric below the needle, you may end up finding your spool thread and bobbin thread getting all tangled up. This is one of the most common sewing machine mistakes you may have observed while indulging in sewing. This can have several reasons and understanding the exact cause will help you arrive at the right solution easily. The upper thread may not have been installed properly. Refer to your sewing machine instructions and rethread the upper thread as per the instructions. The tension of the upper thread may not be proper. Ensure that you have the best tension or at least less tension. The issue may also be caused if the bobbin thread is not properly installed. When you have made a beginning with the sewing machine, you can commit a mistake with the choice of your needle and thread. The type of the thread should go with the type of sewing you are into. For instance, if you are into garments production, it may be practical enough to use a 100 percent polyester thread. Checking the label should help you arrive at the perfect choice. You may also find quilting threads, silk threads and those meant for specific purposes. The same technique should go for the needles as well. Choose the needle based on the preferences you have. Universal needles may be suitable for every purpose, while the specific needles like jersey or ballpoint ones are used for knits and other special purposes. This is one of the most common issues you may be facing when you have just begun using the sewing machine. The fabric may not stand still and keep jiggling – thus not letting you get a regular sewing option. If you have been going through this issue – the remedy should be practically simple and easy. You just need to lower the presser foot. As simple as that! The presser foot will help you hold the fabric in place so that you will be able to stitch in a neat and easy manner than having to indulge in a fight with the cloth! Well, those were just a few of the sewing machine mistakes you may be committing as the first timers. 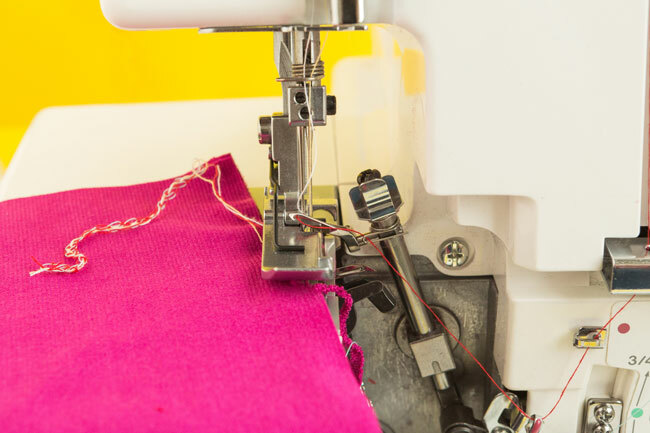 We have featured a few common sewing machine mistakes so that you will be able to turn yourself an expert without having to suffer any sort of issues. Do you have any mistakes that your fellow users have been indulging in the ways to fix it? If you have, do let us know about them so that we will be able to address them as well in an updated post on the topic. Share your inputs, experiences, and opinions through the comments section here below! Wow article,I don’t know what to do with this knowledge because I don’t sew but sure I can share it with my mother who sews and often faces these mentioned problems in the article. I am sure this will help her a lot.